When Shero took over the helm of the Penguins, the organization was stocked with high-end draft picks from the past drafts. But all of those high first round draft picks from 2000-2006 were already on the big club (Orpik, Armstrong, Whitney, Fleury, Malkin, Crosby, Staal). That had ultimately left the minors devoid of many high-end talented prospects. So with the Penguins being ‘buyers’ and not ‘sellers’ at the trade deadlines in the past three years, the only path to gaining prospects is through the draft. Here’s a look at the drafts from 2006-2008. 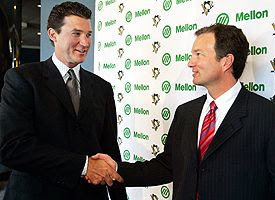 Since Mr. Shero was hired on May 25th of 2006, he didn’t have much time to put his management team together and prepare for the draft. Drafting Jordan Staal with the 2nd overall pick that year had some variables to it (mainly, there was other good talent at same spot), and the 2nd and 3rd round picks were defensemen Carl Sneep and Brian Strait. Both of those could pan out as very serviceable NHL defensemen, and are listed by some to be in the top 10 of the Penguin prospects. The two remaining picks in the 5th and 7th rounds still need to have further inspection. Chad Johnson in the 5th round is actually ranked as the 14th best Penguin prospect by Hockey’s Future, and it is too early to tell about Finnish defensemen Timo Seppanen. He might or might not see time in North America preseason camps for the Pens. Defensemen always take longer than forwards to make it to the NHL, so the jury is still out on this draft class. But the reality of it could be that the Pens would have had a great class if both Strait and Sneep can make it to the NHL, which they are projected to do. Anything from Johnson and Seppanen would be gravy. The 2007 draft still has a ton of potential for the future in the NHL, even though the #1 pick Angelo Esposito has moved on to the Atlanta Thrashers. Esposito had been very highly ranked before the draft but his stock fell precipitously when his work ethic and character didn’t seem to match his talent. When he fell to the Penguins, they took a flyer on him and hoped to turn it around. There were many that felt the Pens paid too much for Hossa, but I think Shero already knew he had a potential dud in Esposito. The remaining picks include Kevin Veilleux, who has all of the physical traits to be a very, very good winger for the Pens. He played through a shoulder injury this year that required year-end surgery, so this upcoming year with the Baby Pens will show a lot. The rest are Dman Robert Bortuzzo, Casey Pierro-Zabotel, Luca Caputi, Alex Grant, Jacob Muzzin, and Dustin Jeffrey. Many (and possibly all) of those candidates could end up playing on the Penguins in the upcoming years. It could go down as an all time draft year for the Pens. Throw in the fact that Eric Tangradi, whom the Penguins received in the Ryan Whitney trade to Anaheim, could be the best of all of them. It could turn out to be one of the best draft years ever for the club. 2008 doesn’t really look like the best draft ever, especially since the Penguins didn’t have a draft choice until the fourth round. They picked Center Nathan Moon in the fourth round, and there is a lot of debate about how far he will go. While listed as a ‘project’, he has pretty solid offensive upside. The negatives include a ‘combustible’ on ice personality (but I’d rather that than the opposite). Goalies Alex Pechurski from Magnitagorsk Jr. came next, and is supposedly the only Penguin European prospect with any promise whatsoever. Gets me thinking that the European scouting team needs to get upgraded. Patrick Killeen from OHL Brampton Battalion (where Tangradi spent the past season) was next, and the Penguins and finally those chose Dman Nicholas D’Agostino in the 7th round. Just like the draft itself, might as well make this short and sweet. Penguins could get some value out of this draft if Nathan Moon pans out. But with so few picks, and the fact that they were later on in the draft, you might want to simply chalk this up to being a lost year in the draft. Shero has been quoted in saying that he feels that the Penguins really need to restock a relatively depleted prospect system. It’s a bit ironic that the Pens have the most talented young players of any NHL team - but their system has been lacking in premier scoring talent up until recently. 2007 went a long way to helping that out, but all of that success was trumped by the missing some draft picks in 2008. Mr. Shero and the Penguins need another draft like 2007. Tangradi played for the Belleview Bulls.